January 19, 2017 By This post may contain affiliate links. Turn a simple 3-ingredient fudge recipe into some insanely cute treats for Valentine’s Day. 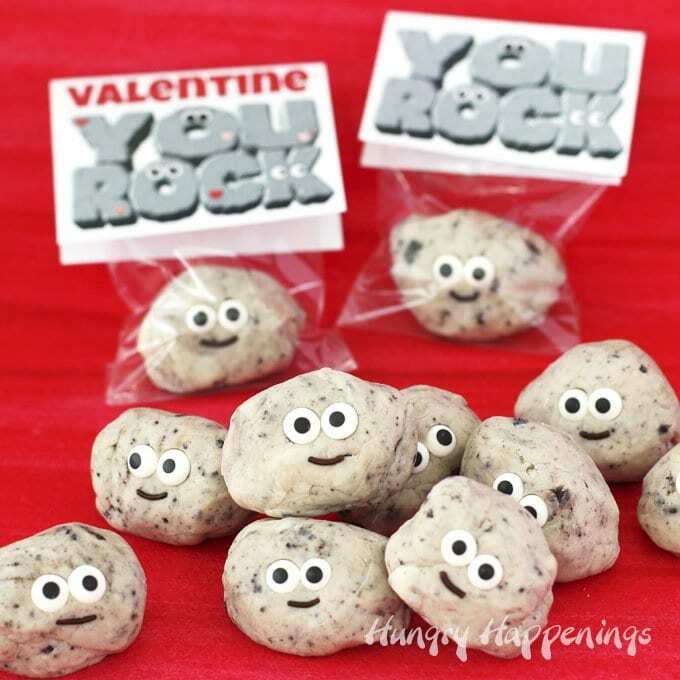 Your kid’s classmates will be thrilled to receive these Cute Cookies ‘n Cream Fudge Rocks especially if they are packaged in cellophane bags and are topped with a “You Rock” Valentine Printable tag. It has been years since I made my first Cookies ‘n Cream Fudge Rock food craft. The simple white chocolate fudge recipe comes together so quickly and easily and once mixed with Oreo Cookie crumbs looks just like the color of rocks. 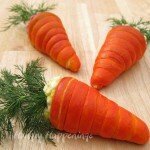 I first used it to make an edible garden stone for Mother’s Day. 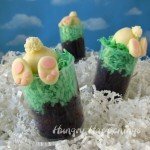 The idea and recipe for that edible craft was such a huge hit that I couldn’t stop making other fun fudge rock treats. 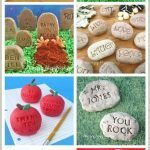 Within a short time I used that 3-ingredient fudge recipe to make Sweet Serenity Stones, Teacher’s Rock, and Fudge Tombstones. Not only were those rocks made out of fudge but they were imprinted with words too. I even went crazy and created a Campfire S’mores Cake that was completely covered in fudge stones. It was really cool. 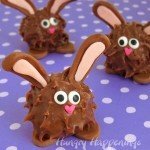 Surprisingly, these simple fudge rocks have been one of my most popular ideas. 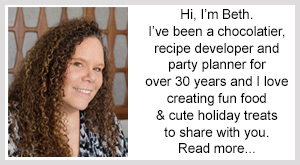 So many of you have shared pictures of how you have used the edible stones to create cakes and party favors and gifts. 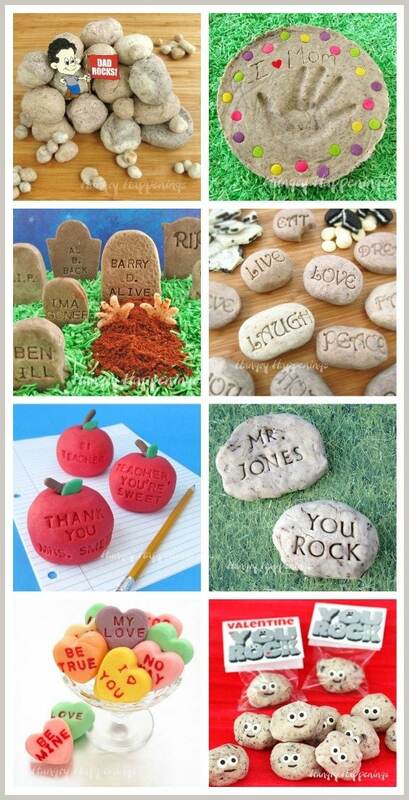 You can see all of the amazingly creative uses for these fudge rocks in my Readers’ Gallery. It’s been a long time since I shared any fudge rocks project with you and am so excited about this one. It couldn’t be much simpler. You make the fudge, let it chill, then scoop and shape it into rocks, add two candy eyes and one chocolate jimmy sprinkle for the smile. 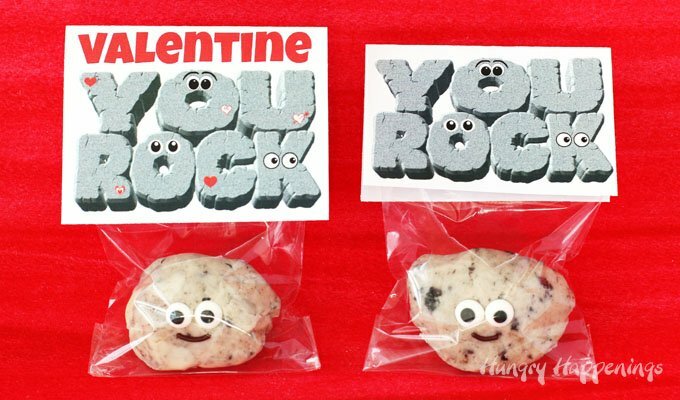 To make these cuties even better, you can package them in clear cellophane bags and add a printable “you rock” tag. Wouldn’t your kids and their classmates love them? Below I’ll share the recipe and a video tutorial. If you’d like to see a step-by-step recipe tutorial be sure to visit my Dad’s Rock recipe post. You can use finely chopped pure white chocolate, white chips, or white candy melts to make this fudge. You can find what you need on Amazon (commission earned for sales). Flecks of crushed Oreo Cookies turn white chocolate fudge into a rock colored treat that can be scooped and shaped into rocks. Add eyes and a smile and you've got the cutest rocks ever. Heat white chocolate/confectionery coating and sweetened condensed milk medium saucepan over low heat. Stir frequently until about 3/4's of the chocolate has melted. Remove from the heat and let sit for 2-4 minutes. Then stir until melted and smooth. Stir in the cookie crumbs. 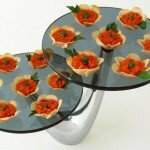 Pour the fudge into a glass pie plate or 8x8 square dish. Press a piece of plastic wrap directly on top of the fudge. Set aside to cool for several hours or pop it in the refrigerator for about an hour until firm. Scoop out about 2 tablespoons of fudge, roll then shape into rocks. 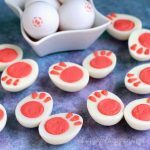 While the fudge rocks are still really soft press two candy eyes into them then add one chocolate sprinkle for the smile. 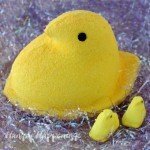 Watch how easy they are to make then get the printable tags below. 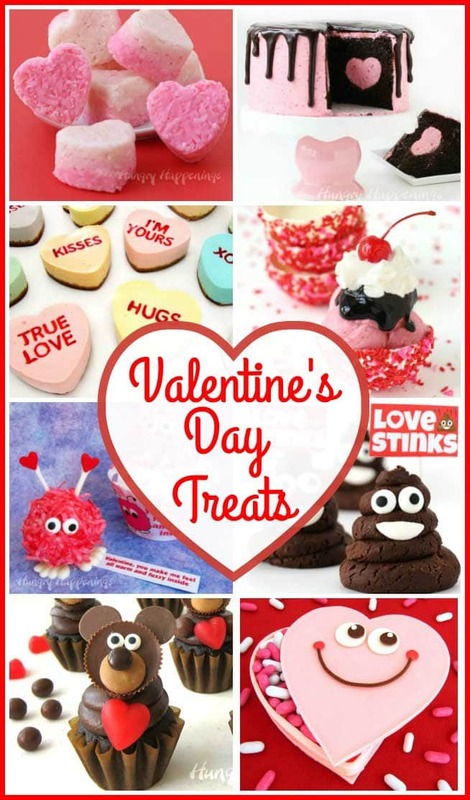 I created some tags for Valentine’s Day and some that you can use for any other occasion. I’ve seen people use them for science fairs, rock climbing parties, and even camp-outs. Click on the printables below and you can print them out. 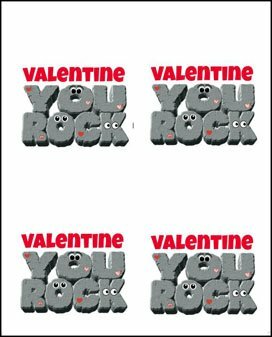 Or use these links to get the Valentine You Rock labels or the You Rock labels. You may need to resize them to fit your bags. I used 3 inch by 5 inch clear cellophane bags to package my fudge rocks and the tags fit perfectly. Cut out enough white above the image so that you can fold it over into a card then use double stick tape to attach both sides of the tent card to the bag. If you like these sweet Cookies ‘n Cream Fudge rocks you might also like these other fudge treats. Thanks, Lisa! I’m so happy with how cute they turned out. Thanks, Karen. I’m actually sending these to church too! I’m sure the kids will love them. 🙂 Enjoy making and sharing your treats. 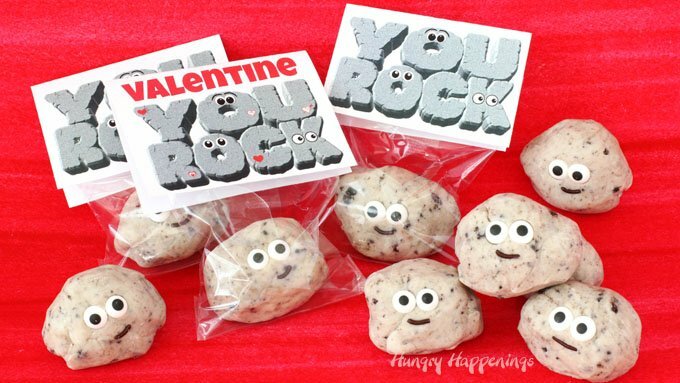 I want to be someone’s rock this Valentine’s Day! 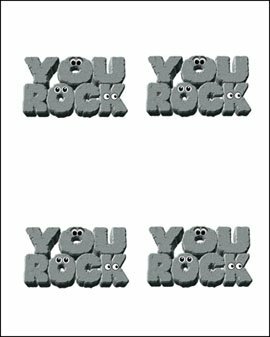 All I can say, it YOU rock!